Is any new season more eagerly greeted than the start of the British asparagus season? I guess with only 14% of British households eating it, there is room for debate, but it certainly seems to be held in very high regard by those who are. Only 5 years ago British asparagus was still very hard to find, with supermarkets importing from places like Peru right through the peak of the home season. However, over the last 5 years the amount grown in the UK has increased by 84% and in its season home-grown now accounts for 90% of the total market. The hard winter followed by a warm April is expected to result in another increase in the amount cropped this year, although our consumption is still very modest in comparison to other European countries (Germany, for example, consumes around 10 times as much as we do per capita). So, a growing market with plenty of scope for further growth it would seem. Supermarkets are responding to this by putting pressure on growers to extend the British growing season which begins at the end of April (St. George’s Day on 23rd might, if you are lucky, see the first cut) and is over by Midsummer’s Day in June. So far growers have resisted, because they want to keep British asparagus special. Whilst it is encouraging that our supermarkets now seem to want to put home-grown rather than imported asparagus on their shelves, it highlights the inherent problems in the supermarket distribution system. British asparagus is certainly a very special product, but what makes it so? The fact that it is one of the earliest crops of the year always adds a certain kudos, but freshness is the critical factor in the quality of asparagus. From the moment asparagus is cut the natural sugars start turning to starch. I have heard of some aficionados who will take a camp stove out into the field rather than waste precious minutes returning to the kitchen to cook it. Contrast this with the supermarket offerings and you will realise that most people have never tasted asparagus at its best. Instead we are seeing a quiet but steady resurgence in the popularity of pick-your-own or roadside sales. At Iver in Buckinghamshire, fruit farmer Peter Shaw has switched 10 acres of land to asparagus and at peak periods 100 people a day come to cut their own. 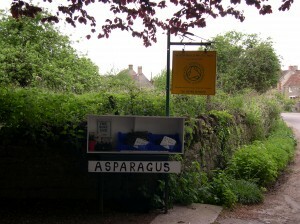 Combining asparagus with fruit farming is not a new idea, the Vale of Evesham gained its reputation for fine asparagus when it was grown to utilise the ground between plum trees. Other PYO soft fruit farms have also begun growing asparagus because the season overlaps with the first of the strawberries. I have noticed that many do not allow the public to cut their own, but because they are already open for selling strawberries, they have a ready outlet for the asparagus. Mention of strawberries brings me back to my original plea to keep asparagus special. The southern slopes of Mendip, where I now buy organic asparagus, were once famed for their strawberries. Crop rotation was ignored in the desire to maximise production with the inevitable consequence that the land became diseased and production had to move to the lower slopes. This is the area where Cheddar strawberries are still grown today, the plants imported from Holland and planted into growbags that come from Ireland. Polytunnels provide the warmth that once resulted naturally from higher slopes relationship to the sun. As one grower admitted to me recently, there is nothing of “Cheddar” in today’s Cheddar strawberries, and despite the fact that in every taste test I’ve conducted they perform poorly in comparison to strawberries grown in the open ground, enough people are still buying them to enable the continuation of roadside stalls that open just for the summer. The asparagus I buy comes from a far more enlightened farmer. The mixed farm produces pork, beef, lamb, vegetables, eggs and of course asparagus, and has been certified organic since 2001. So popular is their asparagus that it takes no effort at all to sell. As it is cut the bundles are placed beside the road and a steady stream of buyers swing past. I have tried, when I wanted to be certain of procuring enough for a special occasion, to ask for some to be kept aside for me. However so certain are they of selling all they can produce that such requests fall on deaf ears! So what would be so awful about extending the season? I must admit, I’m not entirely sure what is involved, but I presume it involves growing under plastic. I have, on this website, already extolled the virtues of Victorian forcing pots for hurrying spring along, so what’s the problem? Apart from the detrimental effect on flavour that I have noted with strawberries (and Jersey Royal potatoes would be another example), I think the brevity of the season is part of the allure. How many times would someone be willing to make the special effort to pick their own or get up extra early to ensure they don’t miss out? At the moment asparagus is a fantastic incentive to persuade people to abandon their usual supermarket buying behaviour. Let’s capitalise on that and then see what we can tempt them with next.